The Reed appears to have a history in South Florida. It is listed in the shipping schedule of fruit with picking commencing in December and ending in January. 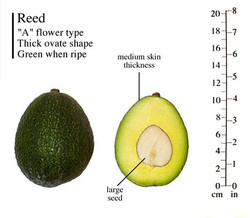 Pine Island Nursery has it listed in their Avocado Viewer. Commercial production has been ruled out but there may be room for this on the home garden. November 30, 2013: On the 2014-2015 picking schedule the Reed has been removed. The tree top worked 11 months ago is doing very well and I'm hoping to see some fruit next year. March 3, 2015: The tree was grafted 15 months ago. It is quite small compared to others. It is definitely a late flowering tree. Only few open flowers in a branch towards the base. Seem that the tree is pushing something not sure if flowers. May 16, 2015: The tree set 6-8 fruit. Not bad for a slow growing tree on its first flowering. Fruit is small seems like a late fruit. The record indicate that harvesting of Reed in Florida was a December to January event. Let's home we can taste it this year. September 19, 2015: All is well the fruit still hanging and growing slowly. Is not a big tree it is compact and a slow grower. I'm surprised that in the last 5 weeks of heat and rain they have not grown much. .That to some extend if favorable. See only 3 fruits. December 12, 2015: The tree is holding about 5 fruits. Seems to be holding them well. I will pick one at the end of December. January 4, 2016: All the fruit was in the ground. This tree is not holding fruit as long as a Monroe so I see no point in continue to cover the tree. October 29, 2018: Tree is holding little fruit under a dozen. Not sure why I did not cut it down in 2016. Will let it go one more season.